How Do You Know If You’re Priced Right? In every business, and every industry, a decision has to be made as to what value a certain product or service holds and what the consumer should be charged. 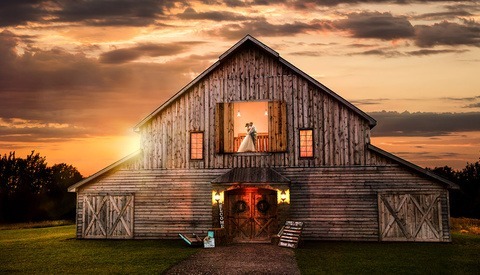 As Wedding photographers, we are often blasted with the stigma of over charging for what “seems” to be an easy and enjoyable job that takes only one day to complete. Obviously we know how false that is, but how do we logically and honestly figure out how to price ourselves? In order to calculate an actual amount for how much we should be paid for our services, we have to take into consideration many variables. Here are the top 3 things that control your price as a photographer. How good are you? You can think of this as comparatively to other photographers, and as well you can place value on being one of a kind and not comparing to other photographers. Do you produce quality work that backs up your brand and value? What sets you apart? Are you a pleasure to have on the job? Do people ever tell you what a great photographer you are, even before they’ve seen a single image you’ve taken? 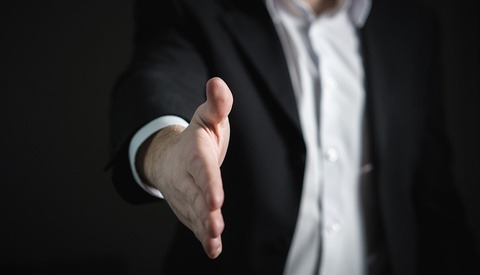 How do you add value to their experience by hiring YOU over someone else? Are you self-taught or traditionally educated? Are your growing at a rate that is faster than the average of the industry? Are you staying relevant, while not following fads and trends? All of these put together will give you a good picture of your inherent value as a photographer. The hardest part is putting an actual dollar figure to this! That’s why we need the next two sections, otherwise we’d be charging so much for ourselves that nobody would ever hire us! Supply & Demand is a well known function in business that helps us determine whether to raise or lower our prices, change our marketing plans, and many other things in our businesses. Supply & Demand is a balancing act and needs to be kept in consideration when figuring out your pricing as a photographer. Supply for photographers usually has to do with the amount of availability to work you have in your calendar. Depending on your life situation, you may choose to limit your supply in order to keep a healthy balance in your life, or you may choose to open up your supply and book up like crazy. Demand is measured by how many qualified leads you receive compared to your supply and compared to the lead rate of others in your area. If you’re getting a lot of inquiries, but a very small percentage of them are able to afford you, then you can’t take them all into consideration when trying to determine your demand. Your demand is based on people that want you and can afford you. If your supply is high (You have lots of availability to shoot left in the calendar) and your demand is low (Not many people are wanting to pay you your asking price to shoot) then you’ve got some decisions to make. Do you lower your price? Do you offer more value while keeping your price? Do you pump up your marketing campaigns so you can get more potential clients that want what you offer? Any way you slice it, when you’re in this situation, you’ve got some work to do! If your supply is low (You don’t have very many dates left for possible bookings) and your demand is low (Not many people are wanting to pay you your asking price to shoot) then you’ve got some room to wait and test out your options. Demand being low is never a good thing, but if it’s just enough, then it’s just enough. Of course we would all like to increase our demand, and there are many ways to do that through marketing and exposure. If your supply is high (You have lots of availability to shoot left in the calendar) and your demand is high (People are lining up to book with you) you’ve got a great situation for a lot of work. Your supply may be high because you’re able to take on lots of work compared to most people, or it might be high because you just opened up booking for the coming year. Either way, now is the time to stay firm on your price and fill up your calendar. If your supply is low (You don’t have very many dates left for possible bookings) and your demand is high (People are lining up to book with you) you’re in the best spot possible for raising your price and being choosy about your bookings. This situation is where decisions can be made to increase overall profit margins and to bring balance back to your family life. Here’s where things get a little tricky. In general, we all want to be ourselves, market who we are, and not give a rip about what anyone else is charging because “they aren’t me!” and “what I offer is so unique that you can’t compare us”. But the reality is that our potential clients are, for the most part, trying to compare us to their other options and trying to see who fits their criteria the best and gives them the most confident feeling. There is nothing wrong with knowing what the going rates are and what your competitors are charging. In fact, that’s one of the best ways to start to get in the ballpark of what you should be charging yourself. You can’t just go and charge whatever you’d like and hope that people don’t compare you to others. You have to decide how you want to be compared to others, and price yourself accordingly. 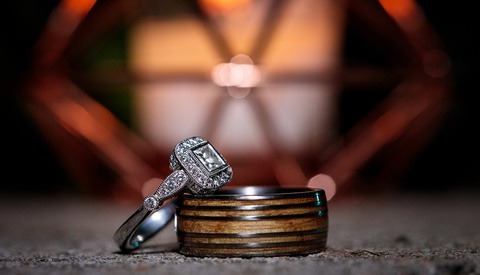 Do you want and deserve to be seen as a high priced photographer? 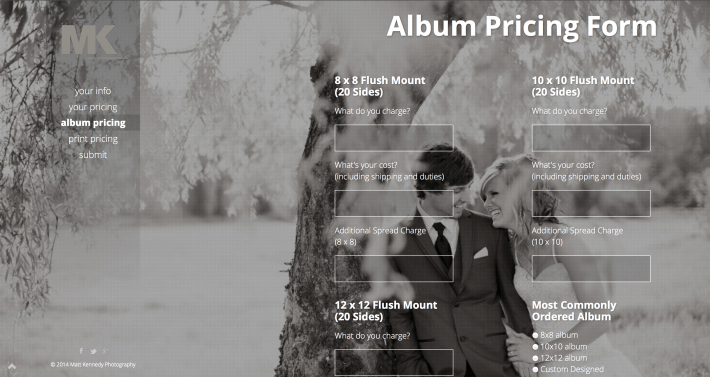 Then find out what your competitors are charging for similar products and services to yours, and you’ll be able to set your prices at rates that show that you’re higher than the average photographer. Do you think you’re not charging enough for your work and you’re just not sure what to charge? Well maybe finding out what the averages in the industry are will help you figure out if you're off base or not. I’ve asked these questions in my business so many times, and I’ve done countless mentor sessions talking about this exact thing with so many people, and one of the hardest things to do is to actually find out what people are charging! So, I’ve created a survey to help us do just that! 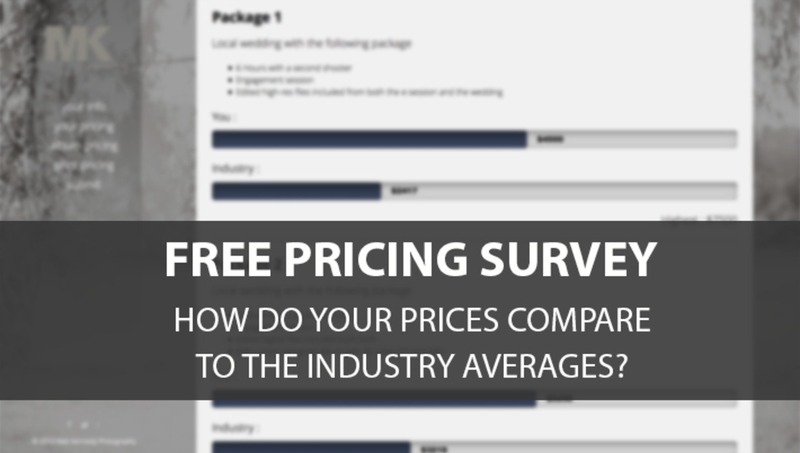 This Photography Pricing Survey was designed to be completely anonymous, while keeping third party accountability to the entries. If you fill our this survey, your information will be directly added to the industry wide averages for each individual item and your comparative results are displayed to you immediately. This data is collected and updated instantaneously and reflects real time stats as the data grows. Presently there are over 700 photographers entries collected, and we hope this number will grow exponentially as people see the value in this and share it with their online and local communities. As you'll see on the website, information about your income and state of business is collected, as well as your prices for a standardized set of packages, standardized album choices, and standardized print options. These are all used in order to keep the form easy to use and concise, while providing a good picture of how your prices would relate to others doing the same thing. As with everything, take this information with a grain of salt, and make sure you're not one of the photographers who exaggerate their numbers. That doesn't help anyone, and nobody's looking at individual numbers except yourself, so really you'd just be hurting yourself. All outliers (anyone with mistypes or grossly outrageous values outside of the norms) will be checked up on by a third party in order to keep anonymity while maintaining accountability. 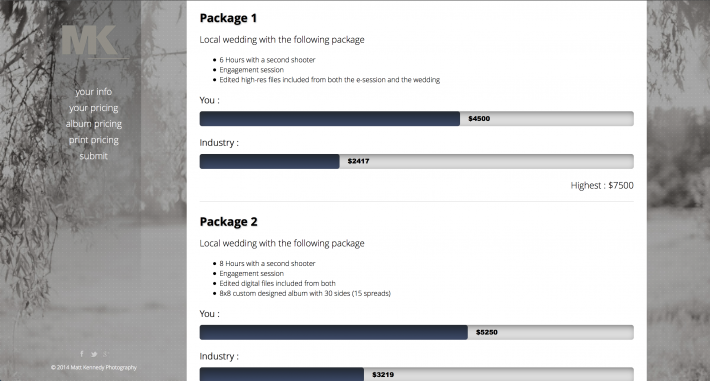 It should be mentioned that this seems to be only for wedding photographers. This doesn't seem to have any application for commercial shooters. It should also be mentioned that this is an advertisement disguised as an article. "How do you know if you're priced right? Buy my video course and find out." This post appears to be little more than a traffic funnel for Matt's videos. I'm betting too that signing up for survey results gets you added to the video course email list. Am I right? How Do You Know If You’re Priced Right? They almost say "No". And yet I was always told not to undercharge because then people would get upset if you raise your rates. Pick the rate you need to function and start from there rather than build your rates up over time.